Home » Tech Tips » Browsers » How to Enable Do Not Track in Chrome, Firefox, Safari and Edge? Although browser tracking may not be a serious threat to your online security, some users are not comfortable with the idea. 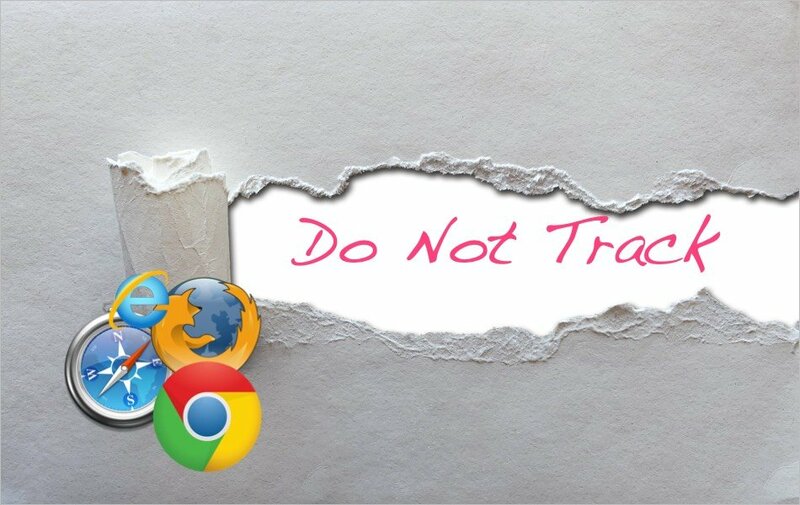 Fortunately, popular browsers provide the Do Not Track (DNT) features to help you maintain your online anonymity. In this post, we will discuss how you can enable the DNT features in Chrome, Firefox, Safari, Edge and Internet Explorer 11 browser. DNT is simply a browser setting that asks the sites, web apps or services to stop tracking the user’s online activities. When you enable the feature, your web browser sends a signal to the websites you visit and their third-party trackers that you don’t want to be tracked. This security setting is available in the four browsers mentioned above so you only need to set your browser tracking preferences. Open Google Chrome and click the three vertical dots on the menu bar to open the Chrome “Customize and control” drop-down menu. 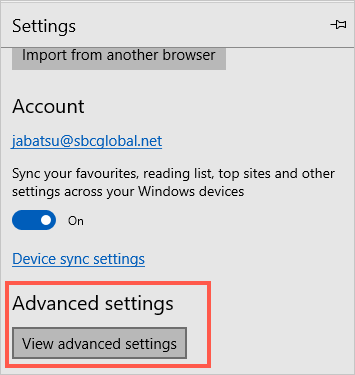 Click “Settings” and scroll to the bottom of the settings page to expand the “Advanced” option. In the “Privacy and Security” options, turn on the “Send a “Do Not Track” request…” setting. Click the “Confirm” on the prompt pop-up to complete the change. You can also block sites and third-party services from saving your browsing data. Expand the “Content settings” option and then open “Cookies” settings. Block all or specific sites from and web applications from storing cookies by toggling on/ off the appropriate switch. Open Mozilla Firefox browser on your PC and on the top-right corner of the browser window, click the menu icon (the three horizontal lines) to expand the browser menu. Then go to “Options” on the menu. 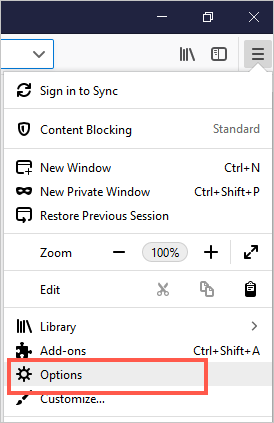 On the left panel menu, click “Privacy and Security” to display the options on the main panel. Under the title, “Send websites a Do Not Track signal…” check the “Always” option. 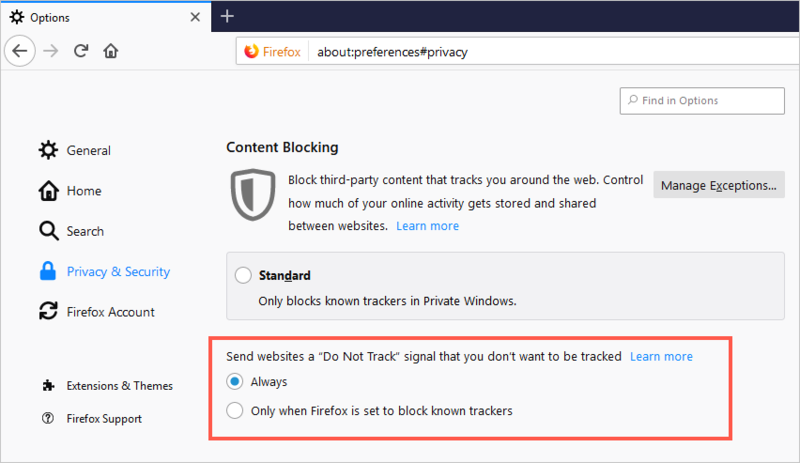 You may activate the “Strict” content block to allow Firefox to block any detected tracking. Microsoft Edge is a Windows 10 in-built browser so it is only available to Windows 10 users. 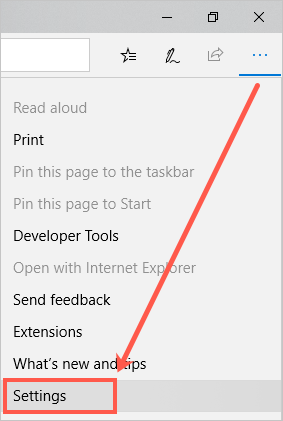 To open the Edge browser, click the shortcut on your desktop/ taskbar or from the Windows start menu. On the upper-top corner of the browser, click the three horizontal dots to open Edge “Settings and More” menu. You can also open the menu by pressing “Alt + X” keys on your keyboard and then select “Settings” at the bottom of the menu list. Scroll down and choose “View advanced settings”. 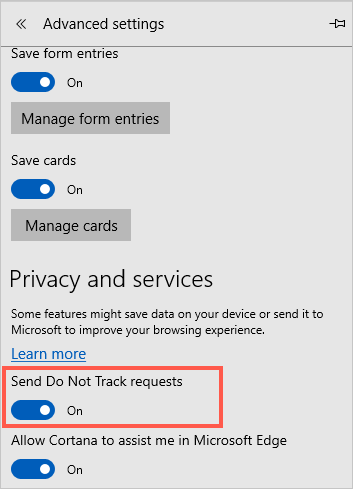 On the “Privacy and services” segment, turn the “Send Do Not Track…” switch on to activate the DNT requests in Microsoft Edge. 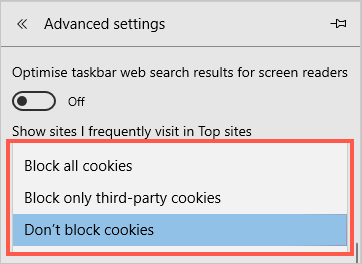 You can as well disable cookies in Edge browser. 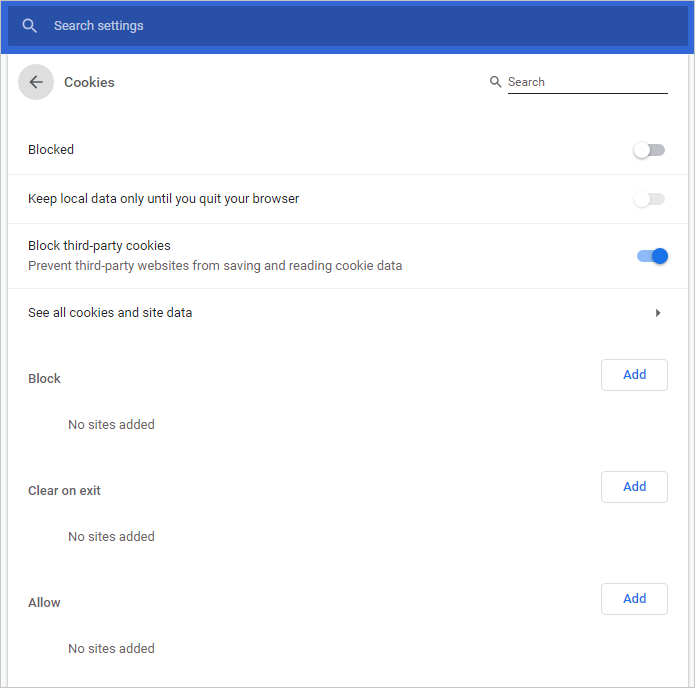 Scroll down the advance settings pane and under the title “Cookies,” select your block cookies preference. 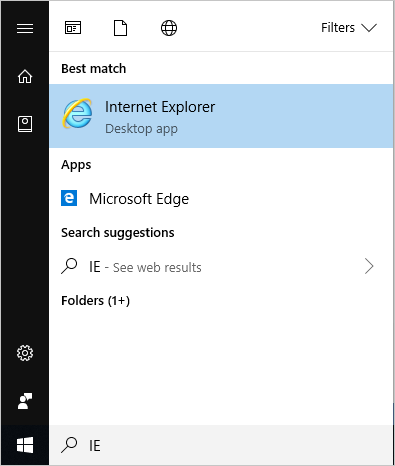 Click the Windows Start button, type “IE’ in the search box and select “Internet Explorer” from the result. 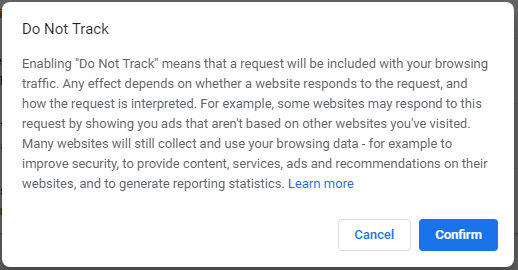 Float the mouse over the “Safety” tools and select “Turn on Do Not Track requests” from the expanded options. Click the “Turn on” button on the pop-up that appears. Alternatively, you can open the “Internet options” from the browser tools and switch to the “Advanced” tab. Scroll down to the “Security” options, check the “Send Do Not Track requests…” box to activate DNT and click “Apply” followed by “Ok”. Follow the below instructions if you are using Safari browser on Mac. Launch Safari and go to “Safari > Preferences…” menu. Navigate to “Privacy” tab and enable “Ask websites not to track me”. You may not recognize this, but websites and third-party trackers are always stalking online. Mostly, this browser tracking enables advertiser and websites to offer more personalized content for a better online experience. However, you can activate your browsers DNT feature to send signals to websites and web apps that you do not want to be tracked. 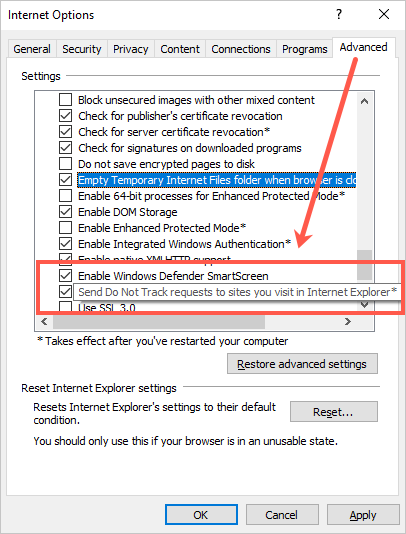 The above steps guide you on how to enable the DNT option from some of the popular browsers.